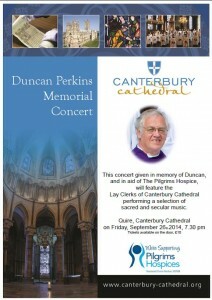 Duncan Perkins Memorial Concert for the Pilgrims Hospice. A Concert of sacred and secular music in memory of Duncan Perkins will be given by the Lay Clerks of Canterbury Cathedral, in the Cathedral Quire, on Friday 26 September at 19:30. Tickets £10 will be available on the door. All proceeds are for the Pilgrims Hospice. Duncan Perkins, who was a member of the Cathedral Choir, singing services daily for 40 years, died in August in the Pilgrims Hospice and his colleagues wish to raise money for the Hospice in his memory. Duncan was a well known Canterbury character, having spent his career teaching French at Kent College, singing solos in this country and abroad, and more recently as a producer and singer in Canterbury Cathedral Garden Opera. David Flood, puts pen to paper to remember our dear friend and colleague Duncan Perkins.